The April 2012 edition of Adventure Lantern is available for download. You can get your copy from www.adventurelantern.com on the right-hand side of our home page. This month I brought you another hefty news roundup with information about upcoming adventure games. We also have an interview with Bryan Wiegele on the Kickstarter project for Delaware St. John episode 4. 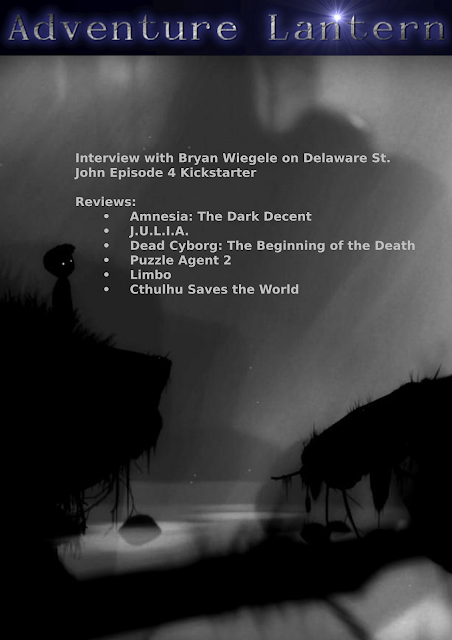 Our reviews include J.U.L.I.A., Dead Cybord, Puzzle Agent 2, Amnesia, Limbo, and Cthulhu Saves the World. From me, Gnome, and Nick. We have an exclusive interview with the developer over at Adventure Lantern.